Some stories are so magical that they sparkle in your mind for a long time after you first hear them. 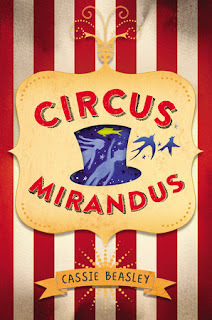 Cassie Beasley's graduate reading at Vermont College of Fine Arts during my first residency almost two years ago was magical, and I'm beyond thrilled that the story she read from is now in a book-shaped package that you can all read: Circus Mirandus! Micah believes in magic and the stories of the magical Circus Mirandus that his grandpa Ephraim tells him. But Grandpa Ephraim is sick, and great-aunt Gertrudis has come to take care of Ephraim and Micah. Aunt Gertrudis does not believe in magic, and she doesn't like Micah at all. When Micah discovers that The Lightbender from Circus Mirandus owes Grandpa Ephraim a miracle, he sets out with his new friend Jenny Mendoza to track down Circus Mirandus and ask the Lightbender to give Grandpa Ephraim his miracle--before it's too late. Circus Mirandus is a hypnotic read. I loved Micah from the very beginning. His devotion to his grandfather, his strong faith in magic, and his struggles with great-aunt Gertrudis make for an instantly compelling story. Although this is Micah's story, Cassie brilliantly weaves in Ephraim's story as a young boy, his first encounter with Circus Mirandus, and the stories of various members of the circus. There are a few surprising twists and turns, plenty of delightful magic, and a beautiful emotional story about love, loss, and faith. The story is always surprising, and the ending especially is unexpectedly perfect. Pick up this book if you love magical middle grade novels with big hearts and beautiful writing! The cover is beautiful, and so is the design of this book. Everything from the dust jacket, the actual book underneath, the end papers, and the magical illustrations. This is one you definitely want to own and hold because a digital file will not do this lovely story justice! I've been waiting for this book!!! I love how pretty this book is!